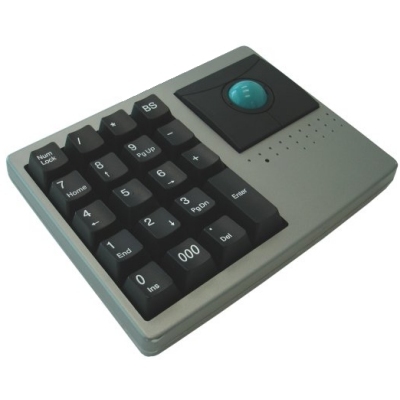 QTronix Scorpius 19 Trackball Keypad. Full 19 key keypad with keypad keys on the left, trackball on the right. Three mouse buttons. Switch from numeric keypad mode to cursor key mode using NumLock key. LED NumLock indicator. Compact, easy to use. Great for use with laptop computers. Excellent for presentations. Installs using USB interface port. Light gauge USB interface cable (6' long) for flexible installation. Beige/Black case, sky blue ball. Keypad keys: 19 keys; Keypad mode selectable using NumLock key. Dimentions: 6"(L) * 4.5"(W) * 1.5"(H) (at maximum case height) in.